ww2incolor.com. Fair use may apply. 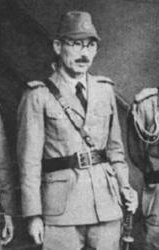 Okawachi commanded the SNLF forces in the second battle of Shanghai in 1937. He later commanded Southwest Area Fleet at Manila, in 1944. The fleet was disbanded in October 1944 but he remained in command of naval units in the area. He refused to cooperate with Army plans to evacuate Manila, and instead brought in 31 Special Naval Base Force under Iwabuchi Sanji to defend Manila to the last man. Okawachi testified in behalf of Yamashita at the latter's war crimes trial, but to no avail.